At least 28 die in a bus crash in Sierre, Switzerland on the return journey of a school ski trip. The bus was carrying 52 children of around 12 years old. The bus crashed after the driver had a heart attack, shortly after 9pm on Tuesday the 13th March 2012. He lost control and swerved into the stop lane of an emergency exit. Both drivers were killed. The bus was travelling with two other buses which got to Belgium safely. All the buses were hired by a Christian tours group. Those on board the bus that crashed were from the Stekske primary school in Lommel, near the Dutch border, and from St Lambertus in Heverlee, near Leuven (Louvain). Stekske Primary School was sitting in the front of the bus, and out of 22 children, only 5 are definitely alive. Everyone on the bus was injured in some way. 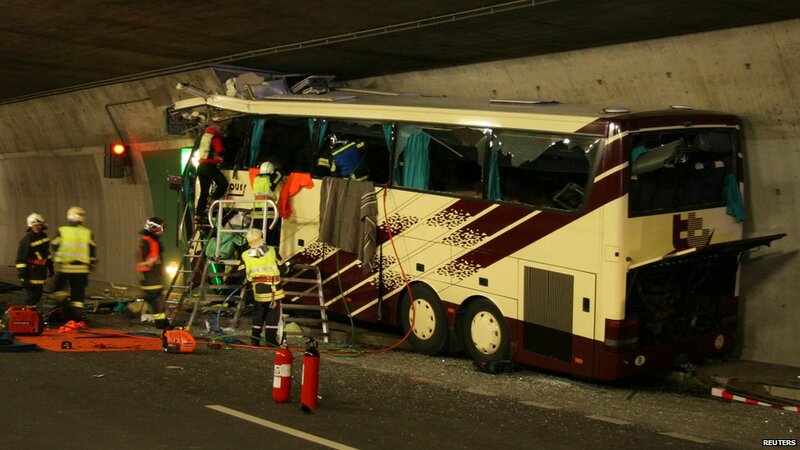 This was the most serious bus crash in Switzerland for decades.